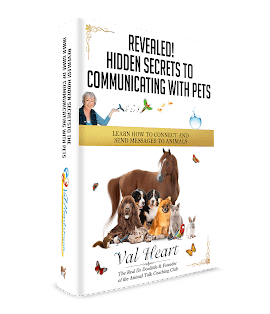 Val’s greatest gift lies in her ability to communicate effectively with animals to get to the true root cause of the problems at hand. This saves you aggravation, stress, time, energy and money over your horse’s health issues. Listen as Val explains why vets are her strongest referral source! Val begins her work by first talking to the animal in question. Communicating with them through a health issue will make a huge difference in their ability to feel heard, acknowledged, and respected. Giving them a voice makes all the difference in the world in deepening your relationships with your horse and resolving health and illness problems. Val works with you and your equine friend to get questions answered, learn what is actually needed to move things forward, discover where the real issues are coming from and determine what the unknown factors are, which is critical to resolving the health issue at hand. Some horses do tend to suffer in silence. I thought this article said it quite well how many horses are suffering with hidden illnesses and may be acting out not from misbehavior, but from pain. This is a shining example of why it’s so important to talk directly with your horse often! For the second year, a nationwide series of more than 160 gastroscopy events showed 60% of horses were identified with stomach ulcers, according to a press release from Merial. Click here to read the rest of the blog posting. Many of Val’s clients have horses that had mysterious illnesses. They felt horse therapy or alternative horse care was called for after exhausting the conventional route. Many diseases or illnesses can hide undetected in your horse for a very long time. No one wants to see their horse suffer, and through communication with your horse you can finally get to the true cause of their issues and get them back to their happy healthy self. Val’s second goal is to help you personally rebalance, regain your clarity, peace and sanity, and be as healthy and resilient as possible. Val works in a very experiential way which makes you a very important part of the process.